NO ONWARD CHAIN. Situated in the popular residential area of Whitby, this three/four bedroom, link detached house offers versatile living accommodation and would make a lovely family home. Being extended to the rear, the deceptively spacious accommodation comprises of entrance hall, lounge, kitchen/breakfast room, dining room, further reception room (which could be used as a bedroom) and a ground floor bathroom. To the first floor there are three bedrooms and a shower room. Externally, there is a styled concrete driveway to the front leading to an attached garage with power and light. To the rear is an enclosed, low maintenance patio area with decking. The property further benefits from gas central heating and double glazing. Entrance Hallway - Entrance door, French doors into lounge, laminate flooring, ceiling light and stairs rising to the first floor landing. Lounge - 4.27m x 3.96m (14'81 x 13'54) - Double glazed window facing the front, electric fire within surround, radiator, laminate flooring and ceiling light. Kitchen/Breakfast Room - 4.27m x 3.05m (14'76 x 10'68 ) - Having a range of wall and base units with complementary work surfaces over, integrated electric oven with 6 ring gas hob and stainless steel cooker hood above. Integrated fridge, inset sink unit with mixer tap, laminate flooring, radiator and ceiling light. Dining Room - 2.13m x 2.13m (7'48 x 7'54 ) - Double glazed window facing the side, external door opening out to the rear garden, carpeted flooring, radiator and ceiling light. Further Reception Room - 2.44m x 3.35m (8'67 x 11'67) - Double glazed window facing the side, radiator, laminate flooring and loft access. Ground Floor Bathroom - 3.35m x 2.13m (11'59 x 7'54 ) - Double glazed window facing the side, wall tiling to full height, radiator and white three piece suite comprising of panelled bath with electric shower over, W/C and pedestal wash basin. Landing - Double glazed window facing the side, loft access, radiator and ceiling light. Bedroom One - 4.27m x 2.44m (14'91 x 8'43 ) - Double glazed window facing the front, radiator, laminate flooring, built-in wardrobe and ceiling light. Bedroom Two - 2.84m x 2.44m (9'04 x 8'45 ) - Double glazed window facing the rear, radiator, laminate flooring, built-in wardrobe and ceiling light. Bedroom Three - 2.84m x 1.83m (9'04 x 6'15 ) - Double glazed window facing the front, radiator, laminate flooring and ceiling light. Bathroom - 2.06m x 1.83m (6'09 x 6'51 ) - Double glazed window facing the rear, heated towel rail, wall tiling to full height, tiled flooring, inset spotlights to the ceiling, enclosed shower cubicle, W/C and vanity wash basin with storage beneath. Garage - 7.01m x 2.54m (23'88 x 8'04 ) - Accessed via an up-and-over door with personal access door to the rear, wall mounted central heating boiler, power, light, housing and plumbing for washing machine. 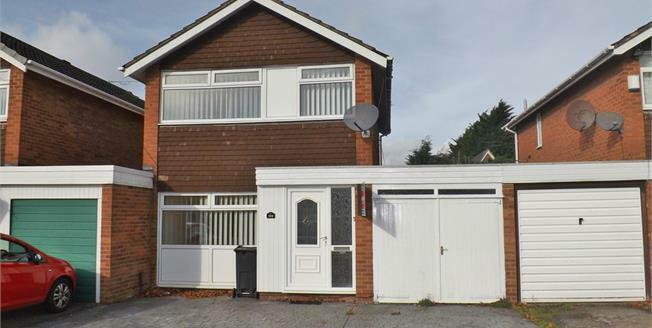 Externally - To the front of the property there is a styled concrete driveway providing off road parking leading to an attached garage. The rear garden is paved throughout for means of ease, enclosed via fencing with a decked area.